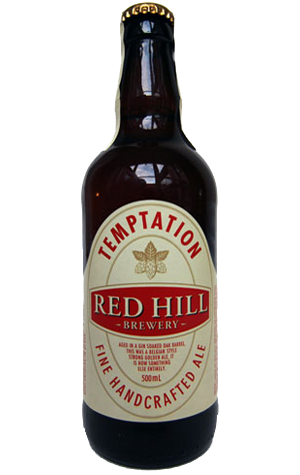 They do like to play around with casks and barrels down at Red Hill, with the latest of their oaky adventures resulting in the release of the Double Barrel Temptation. Fans of the Mornington Peninsula brewery will know and love the Temptation, their once-a-year strong Belgian golden ale. They'll also likely know about their even more occasional "Double Barrel" series, which sees them bottle extremely limited amounts of their seasonals aged in oak barrels. Last year's Double Barrel Imperial Stout aged in whisky barrels was one of our favourite beers of 2013; this time around, for whisky insert gin, with the Temptation spending time luxuriating inside a gin-soaked barrel. As with the stout, the beer became boozier (by the same additional 2.1 percent ABV, interestingly enough) and also evolved. In the case of the Temptation, it retains its familiar hazy golden appearance and the sweet, honey like malty nose, but gains a touch of booze and hints of botanicals from the gin (obtained from the Peninsula's Bass & Flinders Distillery). It remains smooth, if anything is a little lighter on the palate than the original, and has a drier finish too, not to mention a warming, tingling afterglow. Just 20 cases produced.